In the scientific field, the growing visualization of molecular structures on computer screens (mostly obtained by X-ray crystallography) has been restricted to a bidimensional layer as the symbolic representation form, losing its materiality and volume that they had in previous representations. Recent 3D printing technologies offer the possibility to gain a new materiality and scalable tridimensionality, recovering its structural and physical shape. Our experience with this has been shaped in the work Introversión Dogmática. The emergence of a symmetric exchange zone among artists and scientists is clearly bounded to the development of new informatic tools and very high resolution equipment for data visualization . The SciArt movement emerges from this interaction mediated by technology. 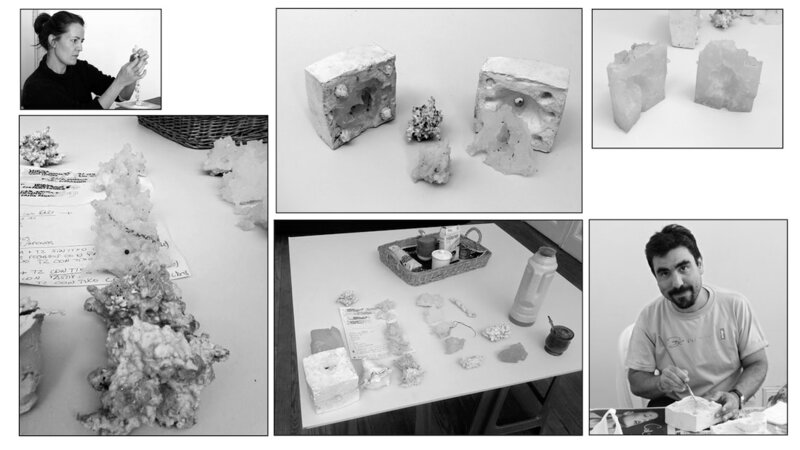 Under the collaborative co-production perspective, the SciArt object retains its ontological link with scientific information but its presentation is mediated by artistic language. By manipulating shape qualities, scale, color, and image intensities, the observer is attracted by a higher strength than would be reached without those modifications, conferring the scientific object an aesthetic “beauty.” Thus, art introduces a mediation between the non-specialized public and the object by enriching visual information, resulting in a cognitive resource for scientific investigation. Introversión Dogmática (Dogmatic Introversion) is a SciArt co-production that discusses both the central dogma of molecular biology (DNA makes RNA makes Proteins), as well as the bidimensional scientific way of representation usually restricted to the screen. Introversión Dogmática proposes an interaction between the public and the scientific object through an immersive, aesthetic approach. Introversión Dogmática appears as an interactive installation that consists of a macro representation of the dynamics of the nucleosomal unit conformed by histone proteins and DNA. These components, obtained through 3D printing technology (FDM) and then copied in silicone, keep a scale that is 10 million times larger than the high resolution structures known from X-rays crystallography technology. The work is a rigorous stylization from a nanoscopic phenomenon realized by the proper combination of usual technologies both from artistic and scientific practices. Upper left: screen captures of the softwares used to manipulate molecular structure files in PDB format: PyMol, MeshLab, and NetFabb. Upper right: experimental diagram of histone representations and DNA. 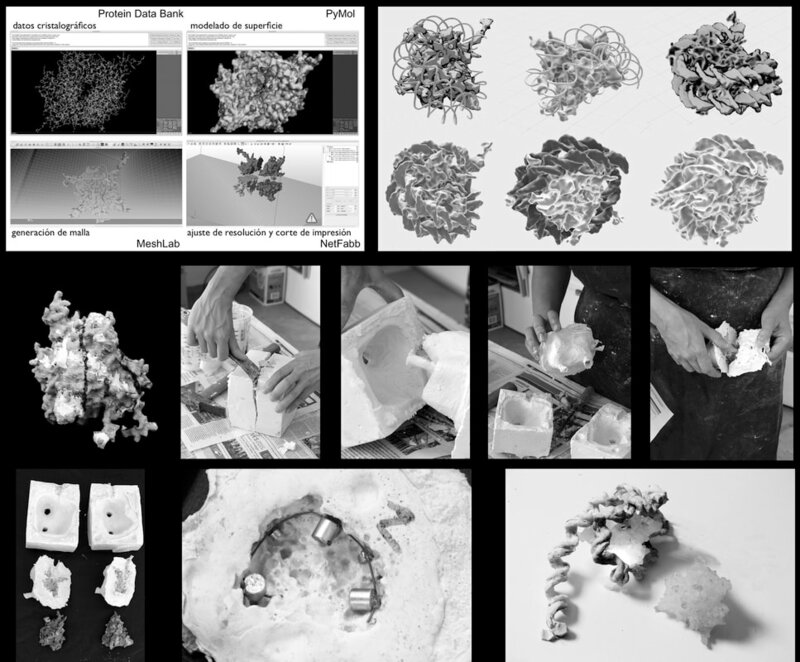 The crystallography data was obtained from the Protein Data Bank and was represented with molecular Flipbook, looking for the proper level of representation for the construction of the prototypes. Bottom: image sequence of the realization of molds, of the 3D printings and of the copies in silicon with the embed magnets. Researching for three-dimensional alternative ways of representation (instead of the usual ones on the screen) in order to visualize the interaction between histone proteins and DNA confronted us with the scale issue and pushed us in search of the appropriate textures and materials. The formal construction of the system’s components kept strict relation with the described X-ray crystallography studies. These models originated from the protein repository Protein Data Bank (PDB) and were 3D-printed following a protocol that was developed ad hoc using open source softwares. The 3D-printing technique was the solution for keeping the rigorous formal match between the described structures of histone proteins and the three-dimensional units. Despite that, our search for a texture that referred to the organic behavior kept us far from satisfactory results because of the hardness of the ABS plastic material resulting from 3D printing technology. As a solution, we opted to incorporate into the process some sculpture techniques for copying those printings in concordance with the desired tactile soft sensation. We made high precision molds in RTV 8001 silicone and then we made copies with the same rubber as well as with with Silastic T2 translucent rubber. Then, we tried different dyes but we discarded them when we realized that at a natural scale, color doesn’t exist. We drove magnets into the histone units in correspondence with the places where interaction with DNA was expected while the DNA units had embedded magnets regularly distributed along its double helix. Once the components of our system were solved, we integrated them as part of a bigger system as an associated medium or environment. For the setting of the system of these molecular units in movement, we incorporated an acrylic cylinder that was set onto an iron base and provided an aquatic medium for the expected interaction. The cylinder, with a capacity of 300 liters and half an inch of thickness, was the container of the system and its surface emulated the structure of a cellular membrane. At the bottom of the cylinder there were two water pumps that regulated the water flow, promoting approaches and ruptures that were facilitated by the magnets embedded inside the histones and DNA units. To promote the desired behavior (having the molecules floating around) we had to increase water density by adding several kilograms of sodium chloride. The lighting of the system was independent from the environmental light: for that purpose we realized we needed a LED screen composed of 52 ultralight LEDs centered in the top cover. The interaction between the system and the environment was regulated by a passive infrared sensor (PIR) usually used as a wall alarm that detected movement that controlled the on/off power switch of the water pumps. This propelled variations in the water flows and produced turbulence, providing the dynamics of the system. The distance sensor also regulated the lighting of the installation through the LEDs matrix at the top of the cylinder. Introversión Dogmática, ArCiTec exhibition at the Centro Cultural General San Martín, Buenos Aires, Argentina, on March 2015. 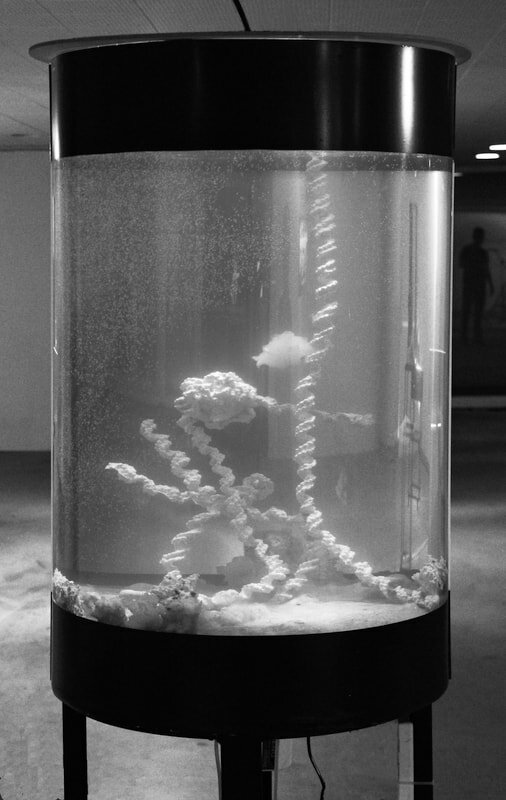 The construction of Introversión Dogmática was made by Colectivo PROTEUS (Proteus Collective) formed by molecular biologists and a visual artist. It has been supported by the generous contribution and advice coming from colleagues, friends, and specialists in specific areas like aquariums, sculpture moulding, 3D printing, and visual communication. 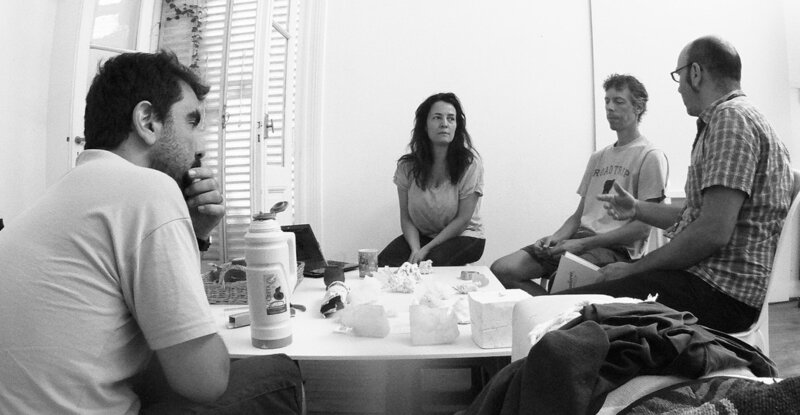 The background of the collective goes back to 2013, when we casually met each other in an eclectic place called GarageLab, a space that facilitated the exchange and sharing of ideas from people coming from different fields. Exploring components and sculptural techniques at the studio. Summer, 2015. Concepts exchange with the person in charge of communication an infographies. Summer, 2015. Histones and DNA interacted in the interior of the cylinder that contained salty water. The cylinder itself acted as a cellular wall and as a container for the dynamic system. The units touched, met, “sponged,” and detached themselves. This dynamic interaction was enhanced by the water pumps coupled to the detection of the movement in the environment which introduced “noise” in the system, generating variations, approximations, and “bonds” between the components. The tangible scale of the units allowed the audience to touch and bind with their hands the replicas of these components that were shown on pedestals beside explanatory infographics. Introversión Dogmática received an honorable mention from the jury from ArCiTec, and continued on to exhibit in 2015 at the General San Martin Cultural Center (CCGSM) in Buenos Aires, Argentina. 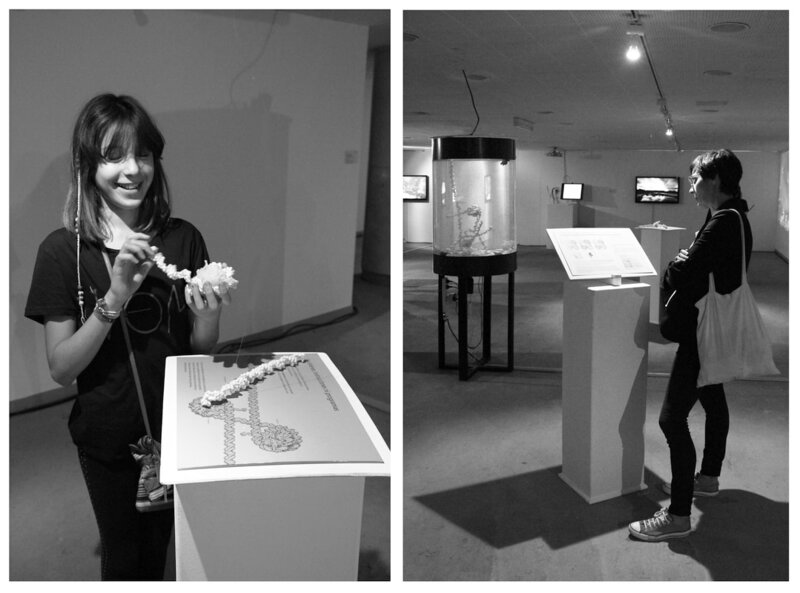 Interaction between our installation and the audience at the exhibition in the Centro Cultural General San Martin. The emplacement of the infographics with the explanations on topics related with scale, generality and a non deterministic approach facilitated a second level of analytic reception from the public. Understanding the concept of an image “as a reference of some aspect of the world that contains in terms of its own structure a reference of the act of cognition that generates it” , could imply that the qualitative step from the perception of a bidimensional image to its tridimensional perception in the space should expand that punctual aspect of the world, offering new theoretical models for the scientific research and new perspectives for its aesthetics appreciation. 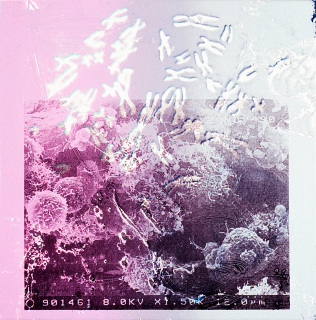 Introversión Dogmática explores this hypothesis, since it is an experiment about the boundaries at the current scientific visualizations as well as a proposal for a new vision that theoretically joins in the molecular biology research field, by questioning the central dogma of molecular biology. The increasing cooperation between artists and scientists which has shaped the contemporary SciArt movement promises for the possibility of coproduction of artifacts and theoretical contents. Because of their novelty, these works escape from traditional categories of both artistic and at scientific fields. BioArt Practice is a primary example of this, as the field still encounters difficulty in definition by theorists, art critics, and the public despite 20 years of history. The confusion related with these SciArt practices reminds us of the reactive reception of all artistic movements that throughout history have made a rupture with established aesthetics canons that dominated their time. SciArt co-productions face the challenge of the (re)presentation of observable phenomenons through high technologies, like X-ray crystallography, and allow us to access molecular information related to the atomic conformation of matter. This information is usually processed under several computational procedures due to its compared analytic studies based on theoretical models in science. In addition, it reveals new patterns in matter that could become plastic qualities for transformation through consecutive technical operations for the acquisition of artistic shapes. This potential transformation of information obtained through high technologies could be defined as the characteristic individuation principle for the SciArt object. The SciArt co-production experience carried out by Collective PROTEUS has taken advantage of the intrinsic multidirectional potential of information to a permeable and shared construction as a process that evolves into shape. The collective interest towards the dynamics at the molecular scale in living systems, turned to the problem of the evolution of information in living matter, is mediated by successive technical operations conducive to its representation. The selection of the consecutive technical transformation steps turned out to be an unavoidable shared reflection about the usual systems in visual representation in the scientist’s research field on one hand, and about the expansion of imagery in the artistic production on the other hand. The result is the Introversión Dogmática installation. Questioning the naturalization of using the screen as the regular interface for the bidimensional visualization of three-dimensional nanoscopic structures was the trigger for our research of new possibilities through 3D printing technology. Introversión Dogmática is the result of the search of the expansion of limits - it is not a bioart experience, neither it is a scientific exercise of science communication piece. It is a physical experience of information. It is an object: a SciArt object. We thank all the contributions of our colleagues and friends that shared the progress of this experience with us. The contribution of Ignacio Sánchez, Co-director of the Physiology of Proteins Laboratory at the University of Buenos Aires, that collaborated to the conformation of the work team in the beginning of the project. We also thank UTN (National Technological University) for offering the frame for the exhibition and diffusion of our creation in the ArCiTec award context. To Acrílicos Lamanna, the company that provided us the acrylic cylinder for the structural body of our work. A special thank to those who simply believed in our project, and gave us some pieces of advices in the right moment, providing their experience, company and friendship. To Mecha Savall who offered her artistic experience and talent to solve problems in the moulding process; to Mauro Tambella, an expert in aquariums that orientated us in the search of props and supplies for the “wet setting”; to Federico Geller who assumed the task of giving effective support on the visual and graphic communication of the concepts and ideas of our proposal, and finally a special thank to Gerardo Gabriel Della Vecchia for his technical support. Reising, Ailin María. “La reunificación de las “dos culturas” a través de la vía tecnológica: implicancias estéticas y cognitivas del movimiento sci-art”. At I Encuentro Internacional de Culturas Científicas y Alternativas Tecnológicas, 2009.